A7 back together and ready to ride with NONE of the new shiny stainless steel bits purchased. My best routes on my old bangers are up into the wilds of Suffick and Norfick via backroads from my mid-Essex base. Cracking up there. I married a Norfolk lass. She's all right, it's just all the other ones I sometimes wonder about. I can take the banter aimed at us Norfolkers, but to lump us in with those scoundrels downs the road in Suffolk is not acceptable. Norfolk is Gods Own Country, Suffolk is the devils ar*ehole (excluding Adnams brewery). Looks like heavy rain during the coming week, which will rinse the salt off the roads. 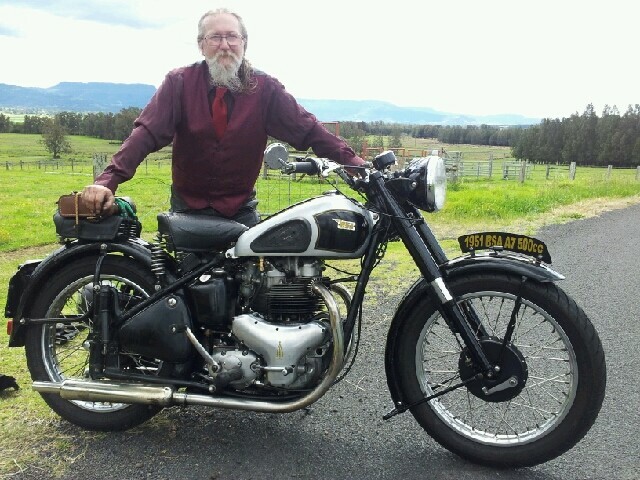 Temperature's should be warming, so with a bit of luck I'll be out and about on my Beeza soon. Yay! Like a sewing machine, eh? Was it doing 'chain' stitch? Oh 'Brother', were you so happy on that machine that you became a 'Singer'? I bet you were just 'bobbin' along! Glad you didn't get the 'needle'! This is a very long 'thread', eh? If you stored your bike gear on top of a cupboard you could describe it as 'Overlocker'. Were you able to keep up with the 'Jones's'? I'll be 'Darned' if I can stop this nonsense! Ok, enough from me; over to you guys! You need another bike GB, you've got too much time on your hands (mind). No, what I need Musky is decent riding weather! Thanks GB, with my dyslexia I was busy looking it up to make sure I used the right word (yes I had to lookup how to spell dyslexia). Page created in 0.563 seconds with 22 queries.